When we bought our first dog, Blue, a 6 week old Siberian Husky, it was suggested to me that I read as much information on Wolves as I possibly could, to better understand Canine behaviour. In doing this I learned so much valuable information. I was shocked at the uneducated behaviour and attitude that we, man, have toward this beautiful, intelligent, animal. I began watching my dog and his instinctual Canine behaviours on a daily basis, thus learning to train him with the respect and dignity that he deserves just because he "is". A year later we adopted another dog, a companion for Blue. Shadow is a cross Siberian Husky/White German Shepherd. However it is my belief that he may have a percentage of wolf in him. He was thought to be about 8 months old, and had come from an abusive situtation where he was physically and emotionally abused and then abandoned to the street. I was told that he had no personality. This gorgeous dog is wall to wall personality. However upon watching his behaviour, along side Blue, there seemed to be a huge difference, which sparked my curiosty and I began doing some extensive research on dogs with wolf in them. And thus my researching wolf material began again. This page is but a small contribution to the wonderous and courageous works of all that have taken endless hours, days, months and years to research The Wolf, for you and I.
I have just included an information page that was taken from an encyclopedia. This is factual, but please do have a read. I have just included a second information page about wolves. We have some beautiful pictures of wolves. They make take a few minutes to load, we thank you for your patience . This gorgeous wolf resembles my Blue so much that I just had to put this one in!! To read Mina's Story please click on link below this picture. 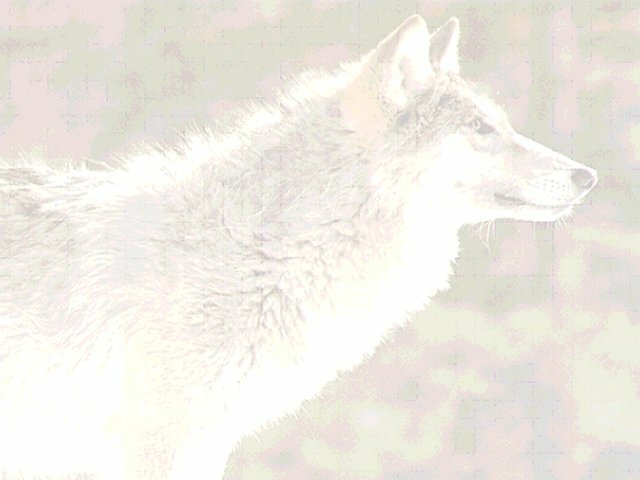 There are some wonderful pictures of wolves at this site. This GORGEOUS picture was given to me by Marge. 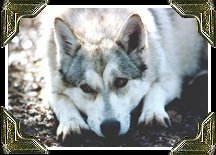 Click on it to visit her Site, which includes wolf pictures, wolf recovery page, wolf information pages and much more. Please do check this site out. It is fantastic. I will add more links very soon, please come back and visit often!! This is a MUST SEE site, the graphics are amazing.